Oliver Opines on 9th Century Cats, His Luxurious Coat and more. Oliver here. I’m doing the Friendly Fill Week #122 in answers this week. This is a blog hop sponsored by our furiends 15andmeowing and Four-Legged Furballs. You join the fun at either one of their blogs or you are welcome to opine about your answers in the comment section of this post. 1. Being _______________ is _____________________. 2.If ___________________ were worth money, then I would be rich. 3. I am proud of _________. 4. If I could time travel, I would visit the year _________. 1. Being a fastidious feline is very rewarding because I receive many compliments on my luxurious fur coat. Now to smooth everything out. This is rough on the tongue. Dear Amazon, I would like to return these hairballs. 3. I am proud of my excellent snoopervising talents. Excuse me Human, you missed a spot. 4. If I could time travel, I would visit the year …well I don’t know the year but I know the century. I would visit the 9th century. The Male and Female Human went to Ireland and when they visited Trinity College in Dublin and saw the Book of Kells The Female Human was fascinated with the story of Pangur Ban. Pangur Ban is a white cat made famous by a poem written by a monk at or around Reichenau Abbey. Some humans say that the poem was a comparison of the monk’s scholarly work with the activity of a cat. Others say that the poem was written by the monk for his cat. I like the second interpretation and can imagine a playful kitty scampering around his human while the monk is working hard at illuminating the pages of the Bible. I would go back to visit that monk and play with his feline friend (and maybe leave some of my paw prints on his manuscript). Here is the poem, I hope you enjoy it as much as The Female Human does. 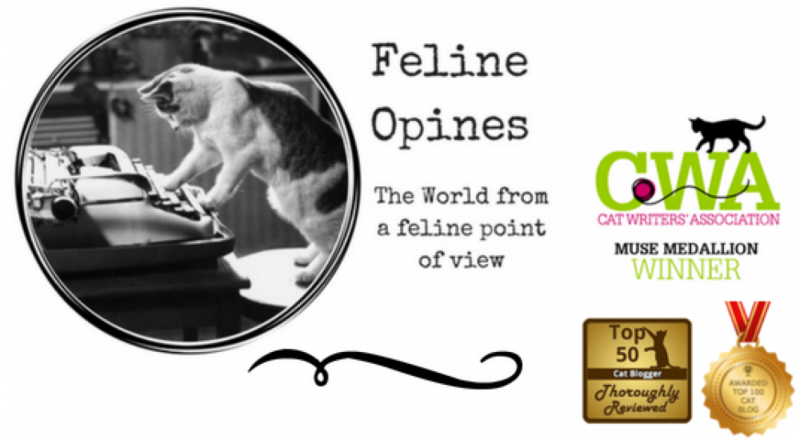 This entry was posted in blog hop, cats, Pet blogging, shelter cats, Top 50 Cat Bloggers and tagged cats and grooming, hairballs, monks and cats, Oliver, Pangur Ban, The Tribe of Five by Feline Opines. Bookmark the permalink. The mark of a cat … you make that fastidiousness look effortless! Love the poem and love all your answers. You should link this post to Feline Friday. You’re more than qualified. That is a lovely poem, i remember Cleveland Amory wanted to name his cat Pangur Ban, but it rejected the name and ended up being called Polar Bear. You are beautiful, and deserve to be admired! You have a beautiful fur coat! Very luxurious! Great fill ins! I asked The Female Human and she said the monk is unknown . Those were all great, especially the poem Oliver! Well done fill-ins Oliver! My Mom and Dad saw the Book of Kells in Ireland too – so beautiful……The poem is really great – we aren’t familiar with it but certainly written by a wonderful poet! It is obvious that if we could sell dog and cat hair, we would all be independently wealthy! Haha! I love the poem. Yo Oliver! Great fill-in answers. I’m fastidious or however you spell it to a fault. I sometimes keep TW awake at night cleaning and cleaning. I wish she was that clean. Why thank you, I’m practicing my modeling skills. Thank you for joining in on the Friendly Fill-Ins, Oliver! You sure do have a luxurious coat. But, we also know exactly what you mean about those hairballs. Your answer to #4 is so intriguing, and now we’re off to learn more about Pangur Ban. Have a wonderful day!